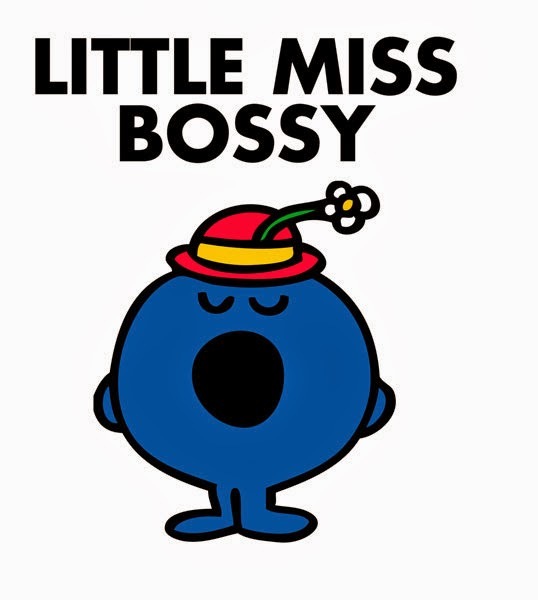 There's been much hullabaloo on the interwebs of late about the word 'bossy' and how detrimental it is for girls to be labelled with that word while they are growing up. No less a big boss woman than Facebook's COO Sheryl Sandberg (she who over-popularized the insta-cliché 'lean in') has been behind a substantial campaign to ban the word, claiming that girls who are called bossy are discouraged from taking on leadership roles. Or maybe her concern is that that girls who take on leadership roles are called bossy and boys aren't. Something gendery and what not that results in too few female leaders. She may have a point, but banning a word is hardly going to change how female leaders of any age are perceived. I had mostly ignored the whole discussion as small potatoes and the voice of someone who had 'made it' wanting to tell the rest of us what making it really looks like. That is, I had ignored it until yesterday - until a memory flashed through my mind - not from my childhood, but from just a few years ago. I was at a family get-together with extended family I don't see that often. I have no idea what we were talking about, but a cousin jokingly said "there's that bossy Shan we all know" or something to that effect. Since I've never been particularly close to that cousin, I let it slide. I told myself "he doesn't know me," "people who know me wouldn't say that," "I was not a bossy child" etc. Only clearly it didn't really slide, since it has come right back to me. Not the exact words used, but the embarrassment and shame of the moment - the great laughs everyone else had, and the fake smile I plastered on to hide my hurt bewilderment. I hesitate now, when I want to comment on that cousin's Facebook profile. I take a beat and ask myself - will this be taken wrong? It's the same bewilderment I've felt when I've been told I'm intimidating. I'm tall, and fluctuate between big boned and fat, so generally when I hear that I'm intimidating I assume people mean because of my physicality. But there's some other thing - a quality of sureness in my speech or a facility with language or an expression on my face - that in some way conveys something to people that I probably don't intend and that I'm not even aware of. I was surprised the first time or ten that I was told I'm intimidating, and then I started just shrugging and walking away. Anybody who knows me knows I love lists and spreadsheets and organizing information, and so I have somehow fallen, for now, into being the defacto secretary of our book club. It's not an official role, it is just something that developed when I said I'd start compiling the book suggestions each person sent in. And then because I had the list I became the person to randomly generate the book suggestion each month. And then because I have family connections I made the arrangements for our book club retreat accommodations. It started to add up. It started to feel like I needed to sit down and shut up. It started to remind me of the parts of me I need to try to silence - what I call "the too-much-ness." With my book club ladies I never meant to 'lean in,' let alone push in, but I felt like that's what I've done. Book club is a place, mostly, where I don't have to try - I can just be. And yet when I found used copies of this month's less common book, I kept my mouth shut. I didn't want to once again be the smarty-pants know it all who acts as though no one else can do anything without my input. Every member of the club is capable of finding a book in her price range. My 'help' is not needed. Sit down and shut up, Shannon. Give someone else a turn. As I left the bookstore and walked down the sidewalk, I started trying to unpack the decision I had made - I tried to understand why I would think withholding information was better than being open with it. And the answer was vibrantly clear - nobody likes a Little Miss Bossy, or her alter-ego Little Miss Know-it-All. It makes me wonder - what would life be like if I didn't have to spend energy shushing myself? What if I didn't care if people thought I was a know-it-all? What if the label 'intimidating' was all about the speaker's lack of confidence and not about my being 'too big for my britches' (let's face it, I have some pretty big britches). I read this a while ago. Normally I write reviews as soon as I finish a book, but for some reason I just didn't have anything to say about this one. When I read Always Looking Up I was impressed by so many things about Michael J. Fox's articulate, insightful, entertaining way with words. I hadn't expected much and my expectations had been greatly exceeded. Reading this much more traditional memoir - a chronological telling of Fox's first 40ish years from army brat to Parksinson's advocate - was interesting, but less telling. In many ways, reading this book second proved Fox's argument in Always Looking Up that his diagnosis with Parkinson's disease has made him a better - or at least a more thoughtful and outward-looking - man. I don't get the sense, at least from his own telling of his story, that Michael J. Fox has ever been a particularly terrible person. He skipped a little school, liked drama better than math, started drinking too early and then too much - but he never seems cruel or unjust so much as lost and self-absorbed. Then he met Tracey Pollan who straightened him out somewhat but not enough to stop the boozing. And then he got Parkinson's and started caring about something bigger than himself and got dry and started his foundation. It's a redemption story of someone who really didn't seem to need that much saving, relatively speaking. Perhaps the problem with Lucky Man is that it ends just as Fox is getting going in his Parkinson's advocacy. Perhaps it was that in Always Looking Up Fox's focus is more philosophical and less a series of events and I'm not really a plot-based reader. Or, maybe I just preferred Always Looking Up because I read it first. It also seemed like Fox's language skill grew between the two books, which I suppose is a natural evolution. It's not that I found anything particularly 'wrong' with Lucky Man. Overall, I was just left wishing I had read it first. Lucky Man provides a foundation for some of the discussions in Fox's second book, whereas reading Lucky Man second meant waiting for him to get to some cool points in the story (such as the growth of the Fox foundation, or his political involvement in stem-cell research advocacy) which didn't actually happen within the book's time-frame. If you haven't read either of Fox's books, start with Lucky Man and go from there. If you've already read Always Looking Up, you may find Lucky Man a bit flat. For the second month in a row our book club book was written by a woman about women's communities and relationships. Last month's disappointing fluff piece Best Friends Forever and the moving, enchanting The Secret Life of Bees couldn't be more different, however. The Secret Life of Bees was an honest and life-affirming tale I wanted to re-read as soon as I was done. The Secret Life of Bees author Sue Monk Kidd writes beautiful, haunting, lovely scenes that stay with you - sucking cold crisp water off a smooth river stone; burnishing a wooden figurehead with honey and beeswax; the wavering heat of a Georgia summer; the wavering heat of a first summer love. She is masterful in creating a full sense of place - temperature, sights, sounds, smells all build a world around the reader. The Secret Life of Bees opens with such a beautiful, slow-moving moment, and they continue throughout the book. If this novel were a piece of jewelry, those beautiful moments would be the well-crafted setting in which the precious stones of the story - the female characters - are securely displayed to their best effect. Darkness is present as well - torment, cruelty, individual and cultural injustice, heart-ache - but the overall effect of the book is one of hope. Not lightness, but hope. After the vapid shallowness of Best Friends Forever it was validating to read a book that accurately represents, to me, the essential value of female relationships. Sisters, mothers (or mother figures) and daughters, friends, members of spiritual communities, employer/employee - a wide variety of women's relationships is revealed in The Secret Life of Bees naturally, slowly, and believably. There are arguments, there are upsets, there are secrets and revelations, and there is, under-lying it all, a faith in the unbreakable bonds between the characters, and in the resiliency and strength of the women. This is writing for, by and about women that reveals on every page the respect the author has for women. It's a refreshing change. Follow this Amazon Associate Link to buy this book. Oh my goodness - when you read a book that features bees, bee-keeping and honey, you get a book club dinner that is as sweet and nourishing as the story itself. Our fabulous chef-hostess for the evening REALLY outdid herself - honey roasted pork loin, honey glazed young carrots, spinach salad with a honey balsamic dressing, scalloped potatoes (honey-free, for a little balance), and an amazing gluten-free honey cake for dessert. And then, just when you think it can't get any better, charming bee-accented gift packages with home-made honey caramels to take home. So much yum! Of course, even with an amazing meal, the conversation is still what makes our book club meetings unmissable, in my mind. It was the first time in a while that everyone has enjoyed the book (maybe the first time ever?). The book included a book club guide, but our conversations are always so varied and wide-ranging that the few questions that we considered were really just sparks for more laughter and learning. Once again at the end of the evening I'm left wanting more. I can hardly wait until next month when we have our first annual retreat.